Roberto Giordani was born on June 1,1967,in Cesena. Son of an artisan blacksmith,he had the chance to learn the first rudiments and the basic techniques of metal forging from an early age,demonstrating an original and outstanding ingenuity,and ability in artistic design. In the early 80's,after he finished his studies,he gained experience working in several italian ironworks and big metal constructions (heavy constructions,steelworks). In the same years he attended various training courses related to techniques of restoration and construction of metal elements in historic buildings at Bufalini School,in Città di Castello,and courses of drawing and sculpture at the School of Fine Arts,in Florence. The first approach to the artistic world happened when he began to spend time with famous painters like:Alberto Burri,Enzo Pecorari and Franco Alessandrini. 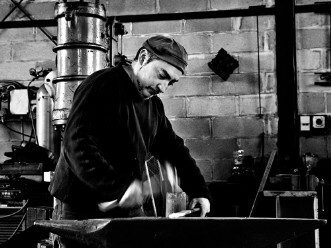 In 1995,during an exhibition in Tuscany,Roberto got acquainted with Toni Beneton,a sculptor from Veneto,who conveyed the desire and the passion for iron macrosculpture to him. Giordani shared and made his Beneton's motto,according to which: "Everything that can be drawn,can be molded into metal.". In those years he came to the decision of combining his technical artisan knowledge with his artistic sculptural skills. From the early 90's he partecipated in numerous shows and competition,and he even showcased live in seminars and in his own workshop his original technique of modeling different kinds of metals,soon obtaining appreciation among professionals,and successes Europe-wide. From then he realized a plurality of works for public authorities and private citizens,and he always tried to achieve the purpose of embellishing and valuing the peculiarities of the places in which these pieces were collocated. His creations are exposed in Czech Republic,United States,Spain,Belgium,Sweden,Morocco and in differente italian cities. Today Roberto lives on Romagna's hills,and works in his recently built and well equipped workshop,where he continuosly applies to his work the research and experimentation combined with his nearly twenty years of experience. In his laboratory he often hosts students of diverse nationality for interships,and besides he organizes public representations of blacksmithing art. He is often invited by schools or at seminars for impromptu demonstrations as well. Last but not least was his partecipation in an event on May 2012 in San Francisco,United States,where he realized a sculpture on the spot. Recently he was included in the group of teachers of the training school of Stia(Ar),in which he teaches courses of: design and metal sculpture. The diligence and the passion always support him in his work and he is firmly convinced to continue his research in every form of art.